! This is NOT a method of direct communication with WINDHAM FLOWERS for purposes of ordering or rectifying problems. The flowers were lovely and a very interesting assortment of material was used. The case was beautiful as well. My daughter was thrilled with her gift! Thank you! I ordered from out of state and had a very specific time frame for delivery. Not only was that met, but the flowers were beautiful! Exactly what I expected they would be. Thanks for taking the time to let us know and for sharing your experience!! I'm very impressed and extremely happy with my recent order. The flowers were absolutely beautiful and arranged perfectly. I would definitely recommend this shop to anyone looking for the best flowers and services. Thanks! We appreciate your feedback! The best thing about ordering from Windham Flowers is consistency. I always know I can trust Windham that I (and the people who receive them) will never be disappointed by the quality, and taste, of the product. Thank you so much. It was more beautiful than the photo and the balloons were more than I hoped for! Above and beyond my expectations. Thank you for making her birthday so special. I am very happy doing business with your company. The website is easy to use, your floral profucts are top notch, your pottery is very nice,I hear, and your delivery service is very timely. Only lower prices would make me happier! Barry, THANK YOU! You keep coming back, and it is always a pleasure! The customer service is exceptional, and I am always "wowed" by the arrangements!!! Thank you!!! The paperwhites delighted everybody and are indeed still lively. The goat milk caramels (Big Picture Farm, Townsend) started much conversation and were a good little addition. All perfect! Thank you for the service and quality. Thanks Christina! We appreciate your business and thanks for letting us know how it went! My dad just loved the arrangement! And, when the flowers collapsed too quickly (probably because of freezing temps during delivery), Windham replaced them with a whole new arrangement! Such great service. Thank you!! Excellent customer service. Aunt Peggy loved her arrangement. Thank you for making her smile on her 85th. The flowers arrived on time, where ordered on short notice, and it produced a great experience! This is what great service is all about! I can't say enough good things about Windham Flowers. I wish we had a florist like you here. Your work is beautiful. You were so expedient even though we could have taken a couple of more days to get these to my friend there. My friend sent me a picture of the flowers that actually arrived and they didn't let me down. She was thrilled. Thank you a million times over and kudos to you. I used to live in the area and loved going into the shop. Now I trust Windham Flowers to put together anything for local deliveries because I know every arrangement they make is beautiful and original (way better than a national chain I've used). I sent an email previously...very professional, responsive service...and the recipient loved the flowers! The arrangements were just beautiful! The center arrangement for the urn was perfect and the two side arrangements provided lovely color. Thank you very much. Thanks for sharing! We are so grateful for your feedback. We were traveling around the country for two months, including Mothers' Day, so we ordered flowers and chocolate to be delivered to my mother in Brattleboro. She said they were absolutely gorgeous, in fact so gorgeous that she actually called the woman who put them together to tell her so! Everyone was happy! Thank you!! Wonderful to hear! Thanks for sharing your experience. So pleased that your Mom loved the flowers. Very happy with my interaction with Windham Flowers. I called to update the message with my Mother's Day delivery and they were accommodating and friendly despite the last minute request. I will order from them again. We are so pleased to hear this! Thanks so much for your order and we look forward to serving you again in the future! We are so pleased to hear this, thanks for sharing! We appreciate your business. the service was great! my mom loved the flowers! i really appreciated how accommodating they were to my late minute order for Mother's day. Thanks, Meghan! It was our pleasure! My mother-in-law thinks that her daughter made the right decision 24 years ago. She was thrilled with the flowers and so I am VERY pleased. Excellent! Thanks for letting us know. Great job! My mom loved them!! Thanks! We are so happy to hear it. Mom's RULE! Easy ordering process and a great value. My mom loved her flowers so much! Kailey! We love your MOTHER too! She is great. Thanks so much for ordering with us. Hope you have an amazing summer, and please stop in to the shop to say Hi when you are next in town! You delivered the flowers exactly as I requested and they were beautiful. Thank you! 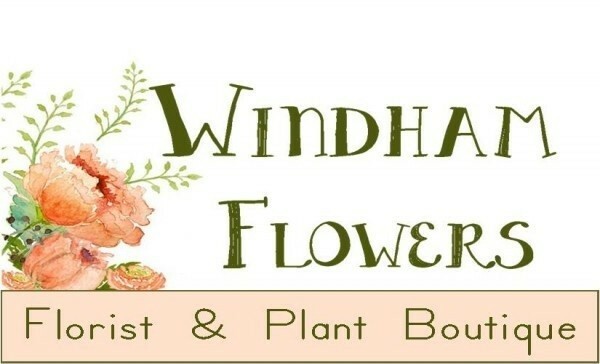 As a former flower shop owner I wanted to take a moment to applaud Windham Flowers as a very superior florist. The quality of the work is top rate and the shop itself is an absolute delight! Aside from the cut flowers, Sally offers an inspiring array of house plants, in-house created pottery, jewelry, soaps, creams and lip balms as well as her specialty - gorgeous orchids! Sally is extremely knowledgeable about plant and orchid care and is always happy to answer any questions on this topic. Definitely my flower shop of choice! Prompt same day service. I ordered lotions for my Mom and she loved them. Hi Tisha! We love our handmade hand lotion, and are so happy that your Mom does too! Sally called me to discuss a concern she had about an order I placed for a condolence arrangement for the family of one of our employees. After we spoke, Sally created an arrangement that I felt was even more tender and heartfelt than my original order. We have since heard from the recipient, who told our employee that the arrangement was the most beautiful she has ever seen. Thank you for helping us comfort someone who is special to us. Thanks, Cindy! We are so pleased to hear that the arrangement was so well received. You were such a pleasure to work with! Arrived promptly on time. Beautiful arrangement. Thanks for the feedback! We appreciate your business. This was a lovely gift! Thanks, Thomas! We are so glad you let us help with this. My partner was super surprised and he loved the flowers! They are just now starting to fade 2 weeks later! Thanks for your order and nice review! We are so pleased that the flowers were well received. My Mother received her tulips and said they were beautiful. Thanks for letting us know! We appreciate your business, and we are so pleased that your Mother was happy! Great customer service and product. They take great pride in their work and maximize your dollars to give the best impression. Well done. Hey, Tim! Thanks so much for giving us a try, and I am really pleased that we were able to make you happy you did! My sister, the recipient, was very pleased with the plant delivered for her birthday. She was delighted with the pottery that the plant was in (I believe made by or at your shop?) and impressed by the skincare sample enclosed with the delivery. I think she will be paying you a visit soon!! Came fast at the last minute and were totally beautiful! Thank you! We were very pleased with the rapid delivery after we ordered the flowers online. The recipient immediately contacted us upon receipt -- she loved the flowers and the gesture. Thank you Windham Flowers! Ordering was easy, delivery timely, and arrangements were beautiful all I had hope for a birthday gift. The flowers were on time and beautiful, and they lasted a long time. The price was reasonable. I always enjoy working with Windham Flowers! Thanks, Christopher! We are so grateful for your business! The flowers arrived ontime, the family who received them sounded happy, no one from my family dealt with the florist. Everything went as planned, thank you. We are so pleased to hear this! Thanks for giving us a try. I always have good luck with your shop. Thank you for your great arrangements and friendly service! Thank you! So nice of you to take a minute to share your experience. Thanks so much for letting us know, Mary! I am so pleased that you enjoyed your flowers for so long! Sally and Windham Flowers did an unbelievably beautiful job on our wedding flowers in May in Brattleboro. She worked closely with us on color and floral choices, and made the whole process fun & upbeat. Thank you so much, Sally! I sent this beautiful bouquet to my mom on her birthday. She was overjoyed at how lovely it was, as was I. Windham Flowers consistently goes above and beyond with their design aesthetic. The flowers were beautiful and delivered the same day I ordered them, so I was very happy with my experience buying from you. I wanted to surprise my mom on a special occasion (we both live in Brattleboro). I used the site in the morning to place my order, also called ahead first to make sure same day delivery was possible. Super easy to place the order, I got emails to confirm payment and later delivery, and my mom was indeed surprised and touched! I'd definitely use this again. Thanks for the feedback! I am so pleased to hear that your experience was great! We look forward to helping you surprise with flowers again! Windham flowers has a very nice website that is easy to navigate. My delivery was prompt and the young lady that received them was thrilled with the size and beauty of the arrangement. Thanks for your order! Very pleased that you shared your experience! I found your website had a very nice selection of flower arrangements and plants for all occasions. My sister, the recipient, was very pleased with both the plant and your service... that you did not just leave the plant on a winter day when no-one answered the door, but instead, called later and returned when you were sure someone was there. Service was wonderful. Will definitely not hesitate to recommend you to family and friends, and will expect to use you again when necessary. This shop was my favorite in Brattleboro (there are other wonderful shops in the Downtown too). I grow orchids and was thrilled to see the unusual ones they had. I was also impressed that they make pretty much everything they sell. Sally and her crew at Windham Flowers were a dream to work with and made our wedding day flowers look spectacular. We worked together looking at colors and styles until she knew exactly what I wanted and stayed within my budget. Ultimate in professionalism, artistry, and excellence! THANK YOU!